Spring comes early for the Pennsylvania Horticultural Society… sometimes when it’s still winter. For the PHS Communications/Public Relations team, spring arrives with the opening of the Philadelphia Flower Show, the nonprofit organization’s signature event and major fundraiser, which this year ran from Feb. 28 to March 8 in the Pennsylvania Convention Center. It’s a “false” spring, created through a greenhouse process that “forces” trees, shrubs and flowers to bloom weeks or months before their natural peak. And while spring is normally the beginning of the life cycle, for us it’s the culmination of months of planning and execution. It’s also a beautiful thing to see – and was successful on many levels this year. The theme of the Flower Show is chosen at least one year in advance by a panel of PHS leaders and consultants, with input from members and visitors. In recent years the themes have moved from place-based exhibitions (Parisian parks, London streetscapes, Hawaiian gardens) to broader concepts inspired by great art or, this year, great movies. These recent themes have required more explanation of how a painting or a film would be interpreted through a landscape or floral design. To make the 2015 theme, “Celebrate the Movies,” easily understood and appealing, PHS formed a partnership with Disney and Disney•Pixar. Every generation has a connection to the classic characters, live action films, or recent animated projects from the world’s best-known studios. Each of the Flower Show’s major exhibitors chose a film from the Disney canon and used it for inspiration. All the language that referred to those exhibits, as well as use of studio logos, would be reviewed and approved by Disney before it was shared with the media or used in any promotion. At the same time, references to other films would appear throughout the show to broaden the appeal to movie fans. Famous posters were designed in dried flowers; sets from favorite films were recreated in miniature with natural materials; iconic actors were honored with namesake roses in the Entrance Garden, an Art Deco movie palace of flowers and lights. The goal of attracting a quarter-million guests to the Flower Show requires a multi-level communications strategy. About 60 percent of the ticket buyers come from the Greater Philadelphia region, so there is a strong concentration on local media in the months leading up to the event. But to attract the other 40 percent from beyond this area, we look to long-lead regional and national media outlets. The targets are travel, arts, and garden media, as well as mainstream digital and print outlets with national audiences. 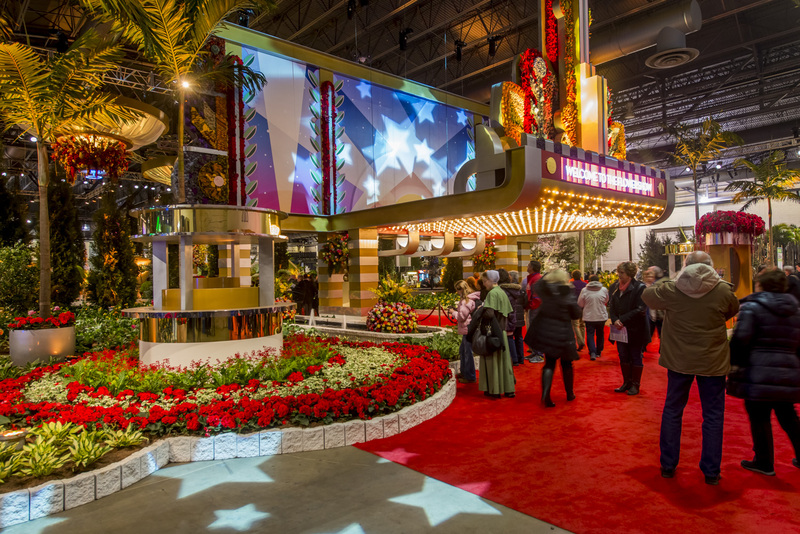 The early pitching focused on the combination of the Flower Show’s history and standing (nation’s oldest and largest) and its 21st century twists (movie tie-ins, new events and attractions). The pitches emphasized the visual elements of the show and included artists’ renderings of exhibitors’ plans and photos from previous shows that evoked the look of the new theme. Special media events included a press conference in New York City coordinated by Visit Philadelphia. The social media campaign for the show included regular blogs focusing on participants and new attractions. A series of videos shared on social platforms and the Flower Show website also explored ways visitors could take concepts from the show designers and incorporate them in their own homes and gardens. The major press conference for the Flower Show occurs a month before the opening and moves to a different location each year, depending on the theme. This year, with the support of Allied Integrated Marketing, the event was held at the Ritz East/Landmark Theatres in Old City on Jan. 29. The takeover of the theater included “Celebrate the Movies” posters in all the exterior and interior light boxes, floral arrangements by show designers, iconic film costumes, “paparazzi,” and a red carpet leading from the entrance through the lobby. The press conference was held in one of the auditoriums, where the speakers spotlighted the new elements of the show and its impact on the region’s economy. Entries in a short-film competition, “What Is Beauty?”, coordinated by PHS and the Greater Philadelphia Film Office, were projected on the screen as the media and guests entered. The Flower Show sizzle reel was shown at the conclusion. The event was covered by all the major local broadcast and print outlets, and strengthened the wave of advance ticket sales. In the week leading up to the opening of the Flower Show, members of the media are invited to document the construction of the exhibits. Reporters and cameras were on the show floor each day of the set-up. On the evening before the Members Preview, 50 area writers and producers attended a Media Preview Tour of the exhibits and had the opportunity to ask questions of the President of PHS and the Chief of Shows & Events. Social media influencers were also hosted on a special tour of the show on opening day. The media and social media efforts this year resulted in strong coverage of the show and a major rise in attendance. National coverage included advance stories and videos by USA Today and the Associated Press. Good Morning America aired live hits from the show on the morning of the Members Preview. New York Times Style section photographer Bill Cunningham covered the Preview Party. Stories and slideshows appeared in print or digital editions of the Washington Post, Conde Nast Traveler, Architectural Digest, Parade, BizBash, and Canada’s Globe and Mail. Hundreds of stories also appeared in local print and broadcast reports. All the coverage translated into a total of 250,000 visitors over the course of the nine-day event, a 10 percent increase over the previous year. Attendance during the final weekend broke all Flower Show records. But most gratifying was the increase in young audiences; the show sold three times as many family packages and twice as many student tickets as the year before. This post was written by PHS Director of Communications, Alan Jaffe. The Pennsylvania Horticultural Society is a nonprofit organization, founded in 1827, dedicated to creating beauty and building community through gardening, greening and learning. With more than 64,000 members throughout the world, PHS offers programs and events for gardeners of all levels, and works with volunteers, organizations, agencies and businesses to create and maintain vibrant green spaces. For information, visit PHSonline.org. This entry was posted in Events and tagged Arts, Communications, Designs, Disney, Event Planning, Events, Exhibitions, Film, Floral, Flowers, Gardening, Greater Philadelphia, Horticulture, Media, Movies, PHS, Public Relations, Spring, Travel by pprablog. Bookmark the permalink.